Whether you believe SEO is Dead or just getting started, getting found in Google is still a priority for inbound marketers everywhere - and understanding how Google sees your – or your clients’ site – will give help define and refine your inbound marketing strategy. Learn how to quickly interrogate Google with these 10 great Google tools/tricks. This will pull up websites that contain links to the website you specify. This can give you a quick idea of who is linking to your site or you can use to to see who your competitors are getting links from. Search for pages that are called linked to by others with the anchor text “inbound marketing uk”. Of you are in the process of link-building, this could be used to find out who is your competition (by being currently linked to for those keywords). If you are new to the field of inbound marketing there will be alot of terms you won’t be familiar with. Save yourself the hassle of searching “define:anchor text” for each and word you need to learn. Instead use ~glossary command to retrieve websites that contain glossaries or dictionaries for your topic of choice. Typing our example into Google will give you a list of websites that contain an SEO or SEM glossary. This search command reveals only the pages that contain your chosen search term (analytics) within a website (inboundmarketing.co.uk) that you specify. So if you read a great article on here a few weeks ago and are having trouble finding it again, use Google to pinpoint the possible pages. Ever find that when you Google a word you get lots of irrelevant pages. Perhaps its because you’re search term has more than one meaning. You can use “-” to remove any websites that contain unwanted words from the results page. Our example would search for the word “rose” but omit any websites that contain the word “flower”. It’s surprising how many internet users still haven’t realized that Google search as a calculator built in to it. Now you know there is an alternative to the fiddly calculators provided on most operating systems you can calculate conversion rates to your hearts content! This will return webpages that are related or similar to your chosen url. Searching our example brings up PR agencies in the Midlands area of England. The related: command is a good way of finding out who your online competitors are. This handy tilde will enter items into your search results that are synonymous for your search word. Save yourself the bother of typing in “flights from london heathrow to boston”! Instead, just type in the two 3-letter airport codes of where you wish to travel from and to. In our example, “Lhr bos” will pull up websites where you can book flights from London Heathrow Airport to Logan International Airport in Boston. 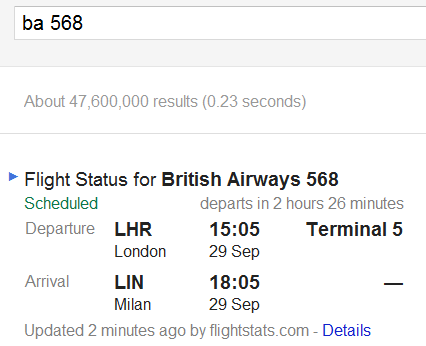 A quick way to check estimated departure and arrival times is to type in the flight code to Google. They will then pull up the flight status, as you can see from this screenshot.